I received an email today from a friend whom I don’t know. Well, it was not a friend, but my own yahoo email id, and yes, I do not know myself so well. The security of My Yahoo mail ID was compromised and it was hacked and used for sending out Spam Mail. Actually, the email was sent from my own yahoo mail ID. So, the thing that struck my mind was that I had not directly accessed my yahoo mail for the last so many days or maybe months. So, how come I received mail from that ID. The one thing that I was sure is that I had not sent the mail. The worst thing was that, the email was also sent to some of the email IDs in my yahoo mail contacts address book. Some of the other recipients were my friends and others were colleagues from previous jobs. This was the worst part and grossly embarrassing. The content of the email was a link to a website that you will be able to recognize in the very first look. Yes, the liked website was a con-marketing campaign. I received an email from my own email ID. I aggregate all my emails from Yahoo, hotmail etc. into Gmail. So, I was totally surprised when I received an email from my personal yahoo ID. That was the first signal of my yahoo mail account being compromised. 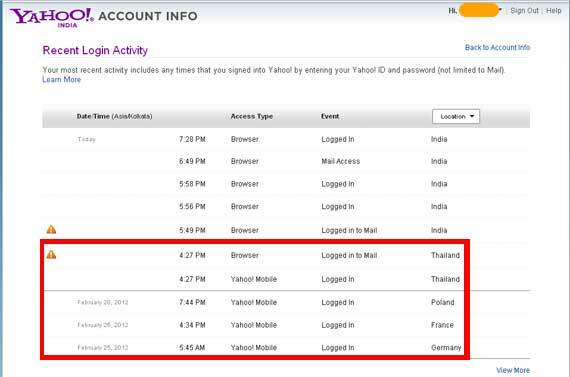 I wanted to confirm if some one else had accessed my yahoo mail ID in the past few days and the day when I had received the email. So, I went into the Accounts settings and clicked on the Access history link on the dashboard. What came in from of me after this was totally startling. Some one had been accessing my yahoo mail ID for the last so many days and I was not even aware of it. It was only due to the hacker’s mistake that I got to know that my yahoo account was hacked. Then I wanted to see the locations from where my email account was being accessed to confirm the fact that none of my friends or relatives had accessed it. My suspicion came out correct. The hacker was no one whom I knew. It was a complete stranger or a rogue geek from 2 different continents. What does the location of the hacker mean if your Email account is hacked? Well, it does not mean much if you find out that your email was hacked and was being accessed from Timbuktu. I say so because, most of the times, the location being recorded by the email client can be fudged by hackers by using proxy servers and other hacking methods. So, much meaning can not be drawn from the locations from where the email was accessed. The first thing that came to my mind was that, the hacker should not be able to send more emails using my Yahoo mail ID. So, what I did immediately after I came to know about the compromise was to change the password of my Yahoo account. Yahoo mail has a security feature for those people who mostly access their email from a single computer, be it a desktop or a laptop. This is called signature. I activated and configured this feature. 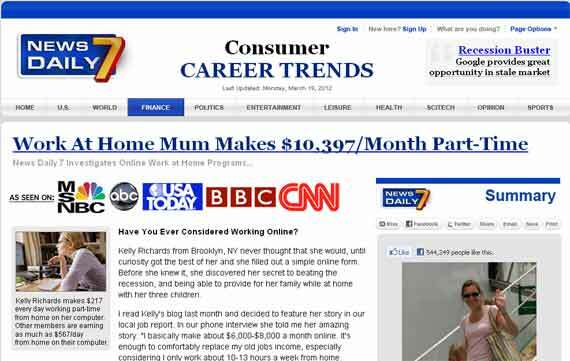 Click here for the detailed tutorial on “How to setup your Yahoo Mail signature“. Knowing the basics of online password security is a must for everyone who has a presence on the web. So, I just did that and applied all those measures required to have a considerably safe and secure password, that can not be cracked so easily. Here is a detailed tutorial on “How to choose a safe and secure password”. Being attentive all the time is a trait that can benefit you not only in other walks of life, but also help you secure your online presence. Had I not been attentive about the emails that I receive on a daily basis, I would not have been able to identify the discrepancy in the mail and my yahoo mail would have been hacked for longer and be used for sending out spam and malicious mails. I was recommended this website through my cousin. I’m not certain whether this submit is written by him as no one else know such detailed approximately my trouble. You’re incredible! Thank you! Hi, I am glad to know that this article helped you in some way. By the way I had written this article after I too was faced with the same situation. In my case the s.o.b. has not only hacked my account, but changed the recovery email and security question! I can't imagine how they hacked it in the first place!